Two years removed from the release of Rogue One: A Star Wars Story, the story of Jyn Erso and her crew is cool again. Not that it ever wasn’t cool, but the fact that Cassian Andor is getting his own prequel series has certainly put the film back in the spotlight. And now, wouldn’t you know it? A new poster is coming too. This one is from artist Tom Whalen, who – in conjunction with Lucasfilm, Acme Archives, Bottleneck and Pulse Galleries – will release a poster based on the hit 2016 film on Thursday, November 15. Gizmodo is excited to exclusively debut both versions of the poster, starting with the regular edition, which is a 24 x 36 inch screen print in an edition of 295 that costs $50 (£38.50). And here’s the variant, which has a UV embellishment, in an edition of 150. it costs $55 (£42.40). Rogue One by Tom Whalen variant edition. Both posters will go on sale at 5pm on November 15, at both Darkinkart.com and Bottleneckgallery.com. Now, if the poster looks familiar, it’s not because you’ve seen it before. This is a brand new poster. But the art was repurposed from something you may have seen when Rogue One was in cinemas. The choice to focus on the Troopers instead of the main characters came because, like many Star Wars projects, Whalen was forced to design the art before he was able to see the movie. Still, he believes it’s a fair, and fun, representation of the film. 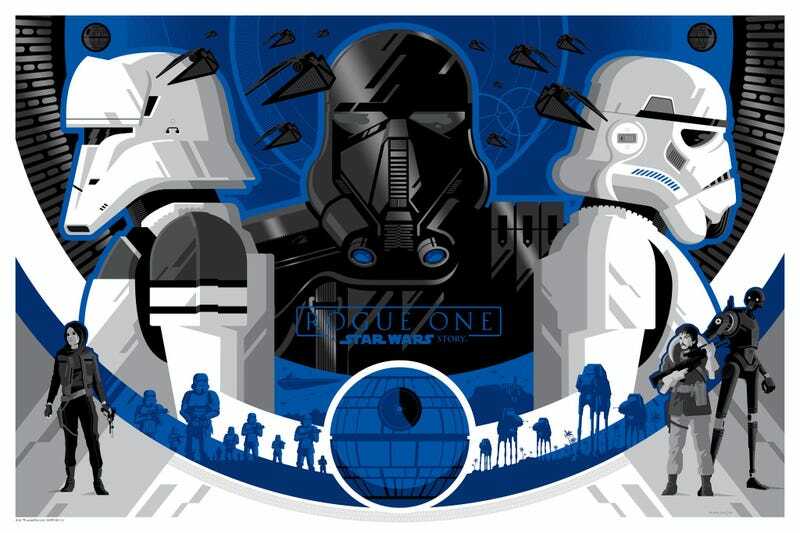 Whalen regularly works with Mondo, Gallery 1988, and other pop-culture art outlets – but, oddly, he’s only done a few Star Wars posters in the past. That’s not a knock on the franchise, though. Like many of us, it was formative in his childhood and he dreams of doing another Rogue One poster.